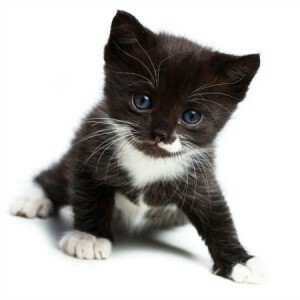 Kittens can easily get infected with worms of several types. Because of their age and small size you will want to be careful how you attempt to treat them. This is a guide about treating a kitten with worms. Someone on here had asked what to worm their kittens with at first. They need to worm all kittens for tapeworms. The best you can do is Praziquantel. It is the same thing as in Droncit, as far as the main ingredient. Here is where you can order it from on Amazon. Sometimes stores like Tractor Supply will have it. Tapeworms are in all kittens more or less, some worse than others. Fleas cause them and will continue to cause them. I have lots of cats and so I have liquid Safeguard goat dewormer. It is Fenbendazole. It is given in 25 mg per pound for three days. Safeguard has to be given for three days in a row so it is not as easy as giving a pill and forgetting about it. But it is for use on cats and dogs and kittens. The dosage, like I said, is 25 mg per pound. I have a kitten that my husband and I rescued in November and it has worms. Is there anything I can give him at home that will help get rid of the worms? My husband won't be back to work till the 1st of the year so what can we do to help my poor kitten? Natural - use forever - FOOD GRADE diatomacious earth. MUST be food grade. Garden and pool DE has chemicals that can poison. Intestinal worms (for humans too) will swallow with pets food. Google lots and you will see how wonderful this is. Will not do a thing for heartworm in dogs. This is intestinal worms only. Kitten? I would use 1/4 teaspoon every day for few weeks then cut back some but never stop as they are exposed to worms from many sources. Good for all animals, even birds. Dosage not critical. Good for health reasons other than worms. Tinctures of black walnut hull and doses of wormwood are frequently used against parasites in pets and readily available. Adding a tiny amount of ground cloves to your pet's diet may help to ward off parasites. Some pet owners report success in using chewing tobacco as a natural agent to kill parasites quickly. Do not use tobacco to deworm your kitten! Nicotine is very toxic to cats and even small doses can be FATAL! I have a new kitten we got the kids. My father-in-law said she got up off the back of the couch and there was a wet spot and a worm there. How can I tell what kind of worm it is and how to get rid of them? I was reading and I saw fleas can pass worms and we have fleas pretty bad. I've been trying to get rid of them, but it's so bad they are biting me up too. I don't make a lot of money and can't just move. I need help with the fleas and her worms. You will need to see your Vet. Your kitten needs vaccinations now too. They will give her a wormer that takes care of most types of worms. Kittens get worms from the mothers blood stream, and from fleas. Your Vet will tell you about the flea protection that will keep the fleas off your kitten so she doesn't get reinfested with more worms. Kittens often get tape worms from fleas. The segments of the tape worm you see looks like a rice grain. Long threadlike worms are roundworms. Your kitten should need only 1 or 2 treatments to get all the worms. But if she gets infested with fleas again the worms can get started again. Question: Does My Kitten Have Worms? I would like to know how to find out if my kitten has worms? The best way is going to be make sure that it has had a vet visit. You can watch when it poops, and if there are sesame seed looking things on the outside of the stool, those are worm parts. Then the kitty will for sure need to go to the vet. They need to confirm which type it is, before they can treat it. Then you can ask them if there is something over the counter that you can use in the future. I never worm any of my dogs or kittens, they never have fleas either, and I just once found a tick on a cat. I live in a rural area and my cats are outside and eat mice and squirrels. What I do is feed them raw beef or pork liver from time to time. I also supplement their dry food with raw eggs, raw ground meat, tuna and salmon from cans. I reason that a well-fed animal is a healthy animal, and parasites attack weak animals. This way I even got rid of parasites on weak, abandoned kittens. Counting back there were at least half a dozen dogs and more cats that I kept/keep healthy in the last 20+ years. Fleas, you may not see there, are a host for worms. Easy way to find out is to watch where kitty does his/her stuff and check it out for little white pieces. You can't miss it and check out her/his behind right after-and frequently-but be mellow about it. There are other types of worms. If her/his coat went down hill and kitty is shedding a lot are other signs. Hope this helps. See a vet! A one month old kitten should still be with it's mother and nursing. Also over the counter medications are more likely to kill the kitten. Also worms can spread to people, and other cats who use the same litter box. Be sure to wash your hands. Also cats who hunt birds, mice are likely to get worms from eating their catch. Feeding raw meat is not good for animals. Even a healthy animal can have worms! I have got a two and a half month old kitten from the pet store. I haven't had her for a month yet and she is the only pet to ever come into my household. She came with fleas as well. She is very active and very energetic. Today 9/26/15 about 4 something in the morning she threw up two really big noodle looking live worms. I need something I can give to her now till I can get her to the vet next week for her appointment and I thought coming from a pet store all kittens, cats, dogs, puppies, and whatever are supposed to have had shots ad be dewormed and deflead before selling them. Can I get the pet store in trouble for selling me a sick kitten? She belongs to my two year old son and I'll be very heart broken if anything happened to her. My son grew very attached just over the few weeks she been here. There are some over the counter pet worm treatments you can buy. However, they may not kill the exact type of worms your cat has. You can try. The pet store will probably only offer you a refund on the pet. Since your child has already bonded with it, you're not going to bring it back, and they know that. Hardly anybody ever takes this offer. You are right, the kitten should be in perfect condition. This is not their business model, however. The kittens sold to stores are bred the cheapest way possible to maximize profit on each animal. That means they are given the cheapest food and many are crammed into one cage. No medical treatments will usually be given since they cost money. The pet store owners usually pretend they don't know about this, and you'll often get a story if you ask, like the animals were raised on a big farm in Wisconsin, or whatever. It isn't true, but their goal is to get you to buy one. Once you get attached to it they know you'll never give it back. The only thing to do is take it to the vet. You could call your local animal control, shelter or humane society. Sometimes they have low cost shots,worming spay/neuter. Also, advice on what the store MUST do. Never, ever get a pet at a pet store. Never. I would let the pet store know and mail them the bill. What do you have to lose. If you post their name it may affect their business they shouldn't want that. I got a sick kitten to from a rescue place I paid $100 but when they found she had hypothyroidism they paid all her medical bills until she was well. That's what they should all do that. So I got this kitten about 2 mos. ago, but I'm not sure how old she was when I got her. She got fleas really badly, we're still battling on that front, but I think we're winning. Now the other night I noticed these teeny tiny worms crawling on my mattress (which she is always lounging on). To say I was freaking out doesn't quite cover it! My husband, "Mr. I lookedituponline", says they're cat tape worms and I can't get them from the kitten. Needless to say I would like a second opinion. Please help! Please take your kitten to a vet for a diagnosis of the worms and neceassary treatment. The "worms" will not disappear without medication. You can also ask the vet if you might have contracted something from your kitten. Note that the vet should be better able to answer your question than a people doctor. A people doctor may not know what your kitten's problem is and will not be able to answer your questions. Yes people can get tapeworms! 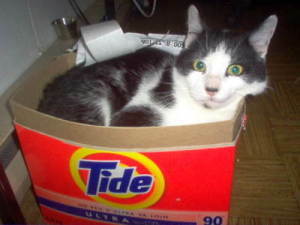 Wash your Linens don't let the cat sleep with you until a week after she has a tapeworm medication on board.